Linda Clarke has an enviable life between her artwork and running a smallholding in one of the most beautiful parts of Kent. 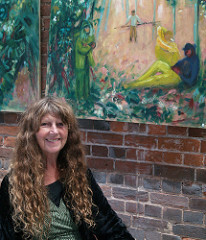 Born in Kent and trained at Medway College of Art in the 1950's, she has exhibited widely, including the R.A. Summer Exhibitions. "I paint my surroundings, which gives me many subjects, from hop-picking (one of my first jobs as a student, picking by hand), wood coppicing, bait digging, fruit picking, animals and birds, and my family. I have always admired abstract painting and have often strived to push in that direction, but the subject matter that infuences my daily life – countryside, animals – are too overwhelming for me to be a figurative painter."